Building a career in construction begins at Ivy Tech Community College. 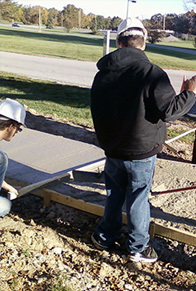 Ivy Tech offers degree programs in both Building Construction Management and Construction Technology. These degree programs will give you the knowledge and skills necessary for job success within the construction industry. You'll learn what it takes to successfully build all kinds of projects, from concept to completion. The Building Construction Management program will prepare you for work in residential, commercial, industrial construction project management, construction contract management, and construction administration. Emphasis is placed on building a foundation in material science, concrete and soil technology, statics and strength of material science, codes, estimating and specifications, scheduling, planning, safety, print reading, as well as surveying and building fabrication. The Construction Technology program provides learners the opportunity to acquire fundamental knowledge and skills in preparation for a career in building construction and associated businesses. Principles involving new construction, remodeling, renovation and repair work for residential and non-residential construction are presented. Program graduates find employment opportunities in skilled trades, building construction supply, general contracting, subcontracting, and building construction industry regulation. Often graduates obtain appropriate licenses and become self-employed contractors.